LDS narratives lay claim to its modern history and offers a narrative consistent with the literal-mindedness of its true-church claim. True-Churchiness then quite casually co-opts membership historical narratives and personal stories as emblematic of the true-churchiness-of-it-all. Anyone who has visited, for example, Martin’s Cove, will be presented with an official Church version of an actual historical event – complete with all the faith-born implications. There is a pointed avoidance of any sense of leadership revelation and decision-making as contributory to human suffering and tragedy. Theology is more or less mortal speculation about imagined realities and natural events that are based on nothing but imaginative interpretation of physical and mystical manifestations. 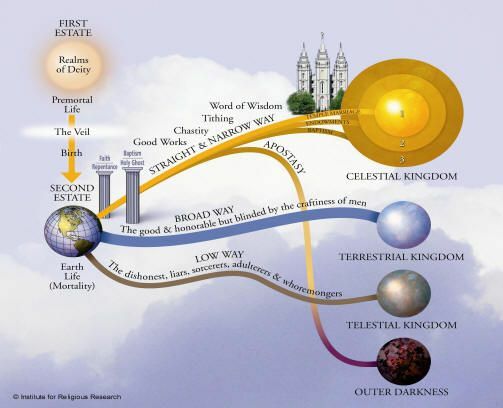 LDS narratives insists on literal acceptance of its theology, claiming, for example that God has instituted a grand design – a Plan of Salvation, if you will. The plan is a concoction of vague ideas and notions that have little basis in reality and a lot of basis in imaginative mortal guesswork. 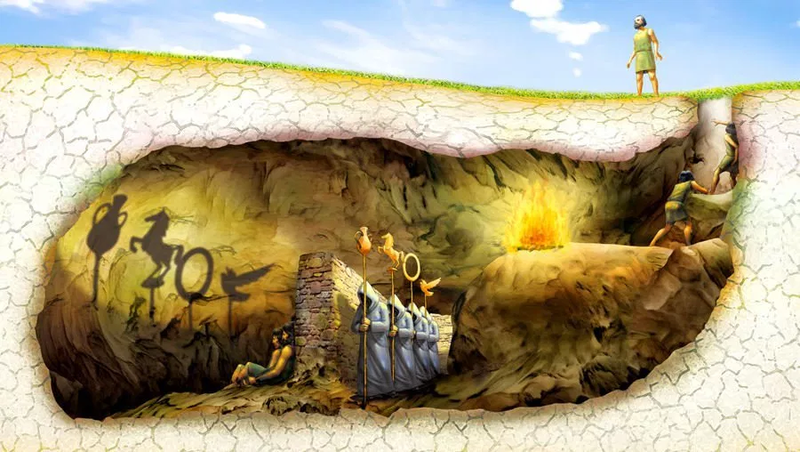 By its own vagueness, the Plan of Salvation is as complex as one would like it to be; full of ecclesiastical and theological guesswork in order to create a useable platform for the array of shallow platitudes presented in the Church’s correlated lesson manuals. LDS narratives have formally and publicly come out in support of the fundamentalist and politically right wing American religious view. The formal alignment is portrayed in the true church’s Proclamation on the Family. Families are prioritized and valued in the true church, but with fundamentalist definitions rigidly implied as being the only way God respects family relationship. In addition, true-churchiness does not hesitate to propose that efforts to promote feminism, homosexuality and gay marriage are not appreciated or valued highly by God because the are considered destructive to the ideal true-church family. Church narrative reveal as little as possible to talk about expending church funds on political processes designed to oppose family relationships that fall outside the “divine” injunction of the Proclamation on the Family. In addition LDS authorities insist that all the families created but who lack the promise and covenant of eternal marriage as sealed by Authority, will not endure beyond mortal life. This circumstance is in fact considered to be the way God wants it: no eternally authorized marriage = no surviving relationship after death. That’s all there is. Frequently (on a monthly basis in Testimony meeting) with an almost unconscious casualness, you will hear a well-meaning soul stand and publicly express feeling sorry for those in other churches (or merely other humans unchurched or otherwise) who do not have the truth that exists in the true church. Awareness of the ignorant arrogance of such a statement (which I’ve heard repeatedly made in the presence of non-members and/or “investigators”) seems to be beyond the sensitivity of the earnest bearer of testimony in that moment. The true-church calling of God to carry that truth throughout the world assumes that eventually the entire world and the entire dead world will have heard of the true-church Plan of Salvation and that once accomplished, everything will be “fair and balanced.” Then Jesus can come back to judge the righteous and the wicked – dead or alive. Reform Mormonism considers truth to be an assessment of things as they are at a given moment in time. Truth is individually understood, not provided from a Church, and as such, declaration of another individual’s religious pursuits as invalid, incomplete, or untrue, is ridiculous. Diversity within religious pursuit offers a variety of individual progression opportunities (new knowledge) that exist only due to that diversity; conversion of all individuals to a singular religious view and approach would suggest the ultimate destruction or elimination of other views, and as such, acts as a barrier to knowledge acquisition. LDS narratives do not separate theology, doctrine and ordinance as superior to policy and procedure. That is to say, the true church does not contain within its walls the true gospel. The true church IS part and parcel of the true gospel. They are not separate in any important sense. Fealty to the true church is the same as obedience to the laws and ordinances of the gospel. Non-fealty to the true church is the same as disobedience to God in the form of not living the gospel.